Infolinks Related Tags important to earn more that’s carry number of clicks. Many blogger use Infolinks Related Tags like to maximize visibility, it helps to Higher CTR and maximize your earnings. 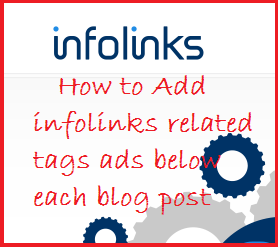 To day I share how to add Infolinks Related Tags Ads in your blogger site. 05.Now you just put this code below of above code. Now you finish your job, just reload your blog site and see infolinks Related Tags Ads are appear.